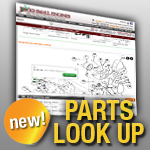 Trust Jack’s when you need replacement belts for your MTD Gold outdoor power equipment. To determine your series number: Look for the model number tag on your tractor. It will look like 138-651-9000. The center number (like 651 above) will be the series number. In this example the series would be 600.